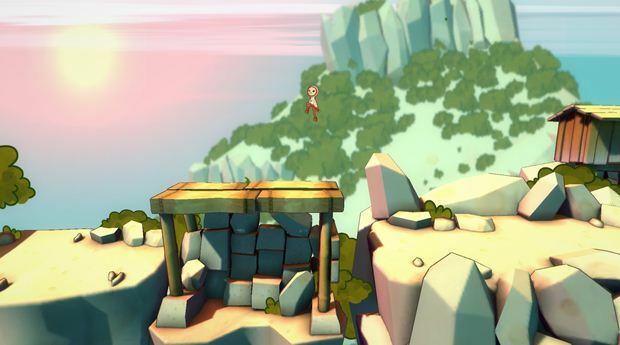 Shu is an upcoming 2.5D side-scrolling platformer indie game, where the player controls a group of characters with unique abilities. In Shu, a village has been hit by a deadly storm which has forced villagers to take refuge somewhere else but some are still trapped and are seeking for assistance. In order to know more about the game, GamingBolt caught up with Sam Gross, Lead Designer and 2D Artist of Shu. Check out his response below. Rashid Sayed: Shu has a pretty interesting concept about saving random people that you meet across your journey. Is there a reason why the player is saving these villagers? Are they going to be awarded with something after they have successfully saved someone? Sam Gross: Yes, there is a reason, and we think it’s key to what makes Shu different. Every villager in the game has a unique ability that can only be used while they’re with you. Players will need to switch back and forth between their two buddies (there are two in each world) to navigate the environment and overcome obstacles. Our latest EGX demo, for example, features the characters Chom and Melo. Chom allows Shu to hover up vertical airstreams, Melo redirects giant trumpets that shoot Shu about. We’d like rescued villagers to have a small impact on the way the game ends, too. Rashid Sayed: Does Shu have a dynamic level structure where the player can decide whom they want to save or is it a fixed set of sequences like any traditional side scroller? 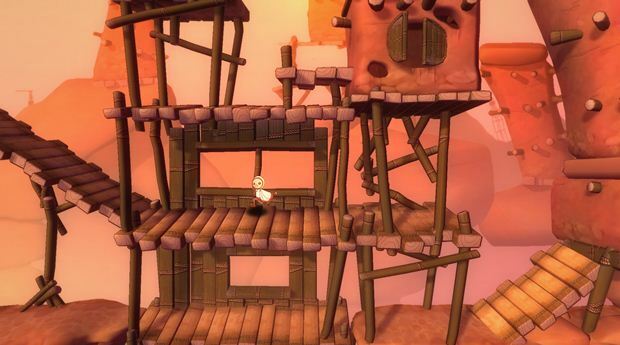 Sam Gross: The majority of Shu’s levels follow a fairly linear path with secrets hidden here and there. However, each world has one Storm level which is a bit of a change of pace. During these sequences the player is pursued by the Storm who, if it catches up, will devour the rear-most character. Once a villager is gone you can’t use their ability any more. These Storm chases need to take into account that a player may have both, one, or none of the villagers with them. The quickest and most rewarding routes require the use of both abilities in conjunction, but there’s always a way through for the unfortunate player whose friends have been eaten. "The Storm is the only sentient threat that Shu will come across on his travels. We decided very early on that we didn’t want enemies that could hurt players, or that players would be called upon to kill." Rashid Sayed: The game utilises hand drawn sprites which obviously requires a ton of effort from the artists. What was your inspiration behind the game’s simple, soothing art style? Sam Gross: Yeah, 12fps per animation, per character, has been a fair bit of work! Our inspirations come mostly from the realm of animated film. The Secret of Kells was a big one at the start, a lot of Disney, a lot of Ghibli. We wanted to work to the team’s strengths and hopefully that’s made the world of Shu appeal in a pleasant, hand crafted sort of way. Rashid Sayed: Is the sinister Storm the only threat that players need to face? Sam Gross: The Storm is the only sentient threat that Shu will come across on his travels. We decided very early on that we didn’t want enemies that could hurt players, or that players would be called upon to kill. It didn’t feel in keeping with the non-violent tone we’d set. Removing all other living hazards puts the spotlight squarely onto the Storm itself – it’s the only malevolent force in the whole game and that makes it all the more jarring. Rashid Sayed: The game is due for all major platforms but not the Xbox One. Why do you think indie developers are still wary of bringing the game to Xbox One? I can’t speak for other developers, but in our case it’s simply a matter of not having had the opportunity. There’s nothing to say that, in the future, we wont look to other platforms. The more people we can get Shu in front of, the better! Rashid Sayed: Is Shu going to support Cross Save and Buy across the PS4 and Vita? Sam Gross: I can’t confirm either way right now. So, maybe? "With Shu we strove for an economy of design, an accessible ‘what you see is what you get’ approach. Shu’s own moveset never changes, but he is temporarily granted additional abilities by the villagers he meets along the way." Rashid Sayed: The Vita is still popular among indie developers, but frankly speaking the platform is dwindling and most likely in its final stages. Given it’s not-so-awesome performance sales wise, why are you bringing it to Vita over, say, the Xbox One? Anecdotally though, Vita owners seem to love the device and are hungry for more content to play on it. It’s kind of a unique space too; an audience of core players sampling a variety of indie games curated by Sony. Rashid Sayed: Are you planning to add certain RPG elements to the game in the form of skills or attributes? If not, what arsenal will the main character have access to? Sam Gross: With Shu we strove for an economy of design, an accessible ‘what you see is what you get’ approach. Shu’s own moveset never changes, but he is temporarily granted additional abilities by the villagers he meets along the way (always bound to one of two shoulder buttons.) This should provide plenty of variety over the course of the game, swapping out abilities in each world, but never going beyond that run+jump+glide+two ability set up. Everything in front of you at all times. You could *almost* play Shu on a NES controller! Rashid Sayed: Before the launch of PlayStation 4, there was a lot of hype. Some developers claimed it would outperform most gaming PCs out there. Now that we have settled down into the current generation, what are your thoughts on the PS4 and those extravagant claims? Sam Gross: I don’t see how any home console could ‘outperform most gaming PCs’ as PCs are constantly evolving. We haven’t seen either Sony or Microsoft’s boxes pushed to their limits though, so there’s obviously more to be gotten out of them. I often prefer late-generation console games to their contemporaries on PC – the stage of a console’s life cycle where they really start wringing out all the power they can. Even though people could argue that they’ve got lower fps, dpi, poly counts (all that boring stuff) they always look better to me; the PS4 hasn’t been around nearly long enough to have had its Uncharted 2, let alone its The Last of Us. Rashid Sayed: Some indie developers faced some amazing experiences while working on the PlayStation 4 like this developer here. Any similar experiences you can share? Sam Gross: Rather than the platform, we’ve had very good experiences working with the PlayStation team themselves. They’ve been very eager to help us out during the development process, posting about Shu on the PlayStation blog and even showing Shu off in their official booth at EGX! This is the first game we have developed for PlayStation and to have the support of a major platform holder is super awesome. Rashid Sayed: Is there anything you want to tell us about Shu? Sam Gross: Just that all of us at Secret Lunch and Coatsink are working hard to get everything finished, and we hope people will check out Shu sometime in (fingers crossed) the middle of 2015!